We've been hit with numerous bouts of colds recently and seemingly permanent runny noses so I've been looking for lots of nutrient rich foods to boost the kids immune systems - fresh juices made on carrots, celery, beetroot, spinach, orange and ginger in the morning and warming drinks with lemon and raw honey in the afternoon when the coughs and sniffles come back. And now that it seems like Winter is finally on the way (we've dropped into single digits overnight in the last few days) it's soup time!!! I don't tend to follow recipes for soup, I usually just throw in whatever veggies we have on hand, add some herbs and stock and call it a day. This soup, which my boys called Sunshine Soup because of its gorgeous sunny colour, was the perfect tonic for my big boy who was home sick from school yesterday. As usual I thought I made plenty but it disappeared in record time and I will be making another batch today! I did this in the Thermomix but you can easily adapt it and I have included alternative directions below. We all loved this soup. My 18 month old ate more than 1 1/2 cups and wanted more but there wasn't any left! TMX - place the ginger, garlic and fresh turmeric (if using) into the bowl and chop 3 secs / SP 7. Add the coconut oil and dried turmeric (if using) and saute 2 mins / Varoma / SP 1. Add the carrot, sweet potato and chop 15 secs / SP 7. Scrape down the sides of the bowl, add the stock or water and cook 20 mins / 100 degrees / SP 1. Blend 45 secs / sp8, gradually increasing from SP 1 to SP 8. Add sea salt and pepper to taste. If not using a Thermomix, place all ingredients except the water/stock and oil into a food processor and process until finely chopped. Pour into a medium saucepan, add the oil and water or stock. Bring to the boil then simmer for 20 minutes or until veggies are tender. 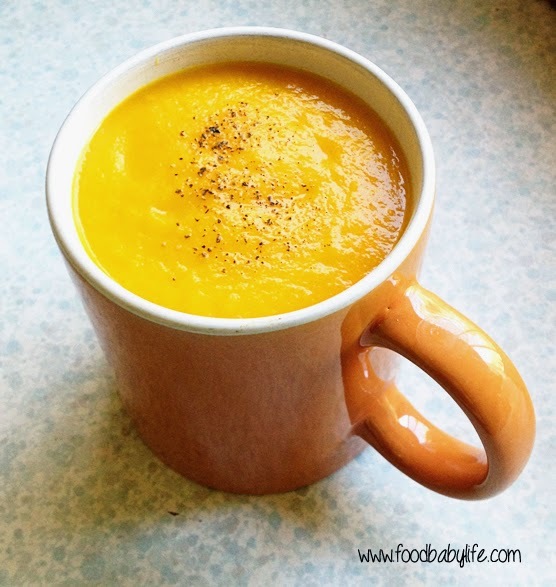 Using a stick blender, process the soup until smooth.